If you choose the round-trip transportation, you'll meet at the New Orleans Marriott, conveniently located on Canal Street in the French Quarter, and board the comfortable 32-person air-conditioned coach for the 1-hour journey to Houmas House Plantation. Upon arrival at the plantation, you are welcomed and directed to either the mansion to start the tour, or to the gardens where you can stroll on your own until the appointed time for your house tour. 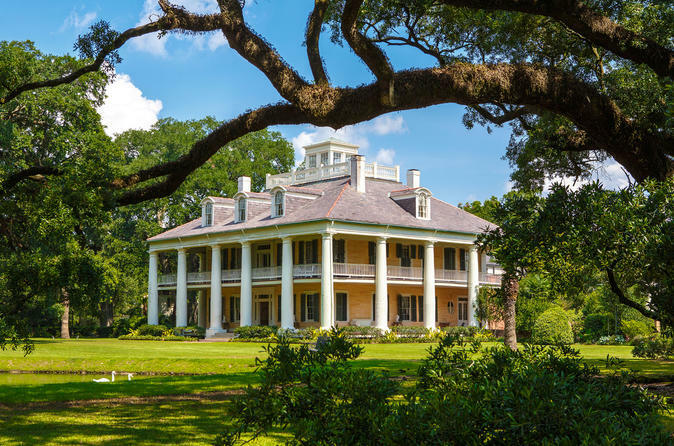 The home was completed in 1828, and by the height of the plantation's production in the late 1800s, more than 20 million pounds of sugar were produced per year. You have the option to take a self-guided tour through the lavish 38-acre (15-hectare) estate, complete with manicured gardens, walking paths and sitting nooks. Head to the mansion’s entrance at the appointed time to meet your guide for your 1-hour tour. Dressed in period costume, your guide provides an educational and theatrical glimpse of the old South as you examine antiques and artwork that decorate the mansion's 16 ornately furnished rooms. You also see the room where Bette Davis stayed while filming for the 1963 movie Hush, Hush Sweet Charlotte. You are welcome to take photos throughout the mansion. Before or after your guided tour, feel free to explore the grounds on your own, or take a break at one of the estate’s restaurants or cafe, where you can purchase a Louisiana-style lunch or snack, perhaps accompanied by a mint julep or a glass of wine. After about 3.5 hours at the plantation, your coach returns you to the starting point to end your tour, if transportation option selected.